State Route 41, North of Narrow Gauge Inn has roadway that is giving way. Caltrans Central Valley District 6 is working to rectify this situation from 6AM-6PM Monday-Saturday. This is expected to continue for the next 3-4 weeks. Please use caution as you travel through this area. Come join Wawona Fire Captain Parker Bevington for an up-close look at fire operations in Yosemite National Park. Drawing from his experience through 17 fire seasons and working hundreds of fires, Captain Bevington will share the history, evolution, and current capabilities of Yosemite Fire. This lecture will be hosted at the Wawona Fire Station and will feature the equipment and strategies that NPS fire fighters utilize when responding to both wildland and structural fire incidents in the park. Bring your curiosity and questions for this informative, interactive evening! Visitors are invited to help us celebrate Earth Day, National Junior Ranger Day, National Park Week, and John Muir’s Birthday in Yosemite Valley. Public transportation is a wonderful way to visit Yosemite Valley. YARTS (Yosemite Area Regional Transportation System) buses run multiple times daily and provide visitors with a safe and convenient way to visit the park. To learn more, visit www.yarts.com. Sometimes animal cruelty knows no bounds. Video footage showing two hunters killing a black bear mother and her two cubs inside their hibernation den in April 2018 has now been released to the public. According to Alaska’s KTUU-TV, the video was published by the Humane Society of the United States following a public records request from the organization. In the graphic video, Andrew Renner and his son, Owen, are seen peering into the dark den of a hibernating black bear, before firing a handful of rounds. The two bear cubs inside can be heard shrieking in fear as they sense the danger that is lurking outside their home. Eventually, Andrew Renner takes the first shot. Then, a second and third one, effectively killing the mother bear and both cubs. “They’ll never be able to link it back to us,” one of them can be heard saying in the video. After they commit the killing, the father-son duo drag the body of the mother bear out of its den. With his hands and arms covered in blood, apparently pleased by their deed, Renner gives his son an enthusiastic high-five. They then pose for a few photos with the dead mother bear, before skinning her and stuffing the hide in a bag to take home. But the crime doesn’t stop there. The camera caught the Renners again two days later when they came back to the scene of the crime to eliminate the remaining evidence. In the video, they can be seen getting rid of stray shell casings in the vicinity before bagging the bodies of the bear cubs they had originally left behind. The cameras that caught the atrocious crime in Esther Island, Alaska, were originally installed for a study by the Alaska Department of Fish and Game and the US Forest Service. “This video of a father and son killing a mother bear and her babies in their den and showing complete disregard for the lives they are taking is reprehensible,” Humane Society International President Kitty Block said of Andrew Renner and son Owen, as quoted by UniLad. Last August, the Renners were charged separately on multiple counts, including unlawfully taking a female bear with cubs, possession/transporting illegally taken game, and tampering with physical evidence. Both men pled guilty to the charges earlier this year. Andrew Renner was sentenced to three months in jail and barred from hunting for 10 years, while his 18-year-old son, Owen, got a slap on the wrist with a 30-day suspensed sentence and mandatory community service. “What we saw is that there were two bear cubs that were completely defenseless and were shot at point-blank range,” Alaska Assistant Attorney General Aaron Peterson told the court. He continued to state that the crime committed by the Renners was the most egregious bear cub poaching case his office had ever seen. According to the Humane Society, the killing of cubs, or a mother bear and her cubs, is illegal in the part of Alaska where Andrew Renner and son Owen had committed their crime. The organization warned that the actions caught on the video could be a glimpse into what might happen if new regulations from the federal government are implemented. The organization has released the video to raise awareness about the federal government’s plans to roll back protections that were put in place to prohibit cruel methods of poaching. Hunting methods that are considered unlawful include taking wolves and pups during the denning season, shooting swimming caribou from motorboats, and using dogs to hunt. Killing a mother bear or her cubs is still legal in some other parts of Alaska. Plan to make a day — or a night of it. Visit Yosemite Mountain Sugar Pine Railroadfor more information.The Yosemite Mountain Sugar Pine Railroad is located at 56001 Highway 41 in Fish Camp. Visit them on Facebook to see what’s happening at the Railroad. NOTE: The Board will be asked to approve all of the following items by a single vote, unless any member of the Board or of the public asks that an item be removed from the consent agenda and considered and discussed separately. The public may address the Board on any matter pertaining to the school that is not on the agenda. There will be no Board discussion and no action will be taken unless listed on a subsequent agenda. Speakers will be limited to 3 minutes. Consideration and action on various items relating to the re-opening of YWECS – including class size decisions, instructional aide hiring, open- enrollment period, etc. Consideration and action on the approval for ARC to use the school facility this summer, pending their submittal of a completed Facilities Use Agreement. Request that various items be placed on the next agenda for discussion and/or action. Unless otherwise announced, the next regular meeting of the Board of Directors will be scheduled for Tuesday, May 14, 2019 at 5:30 p.m. at the Wawona School. Note: The Board will consider and may act upon any of the following items in closed session. Any action taken will be reported publically at the end of closed session as required by law. YOSEMITE — The Mariposa Grove Road will reopen to automobiles on Friday, Apr. 12, officials in Yosemite National Park announced today. 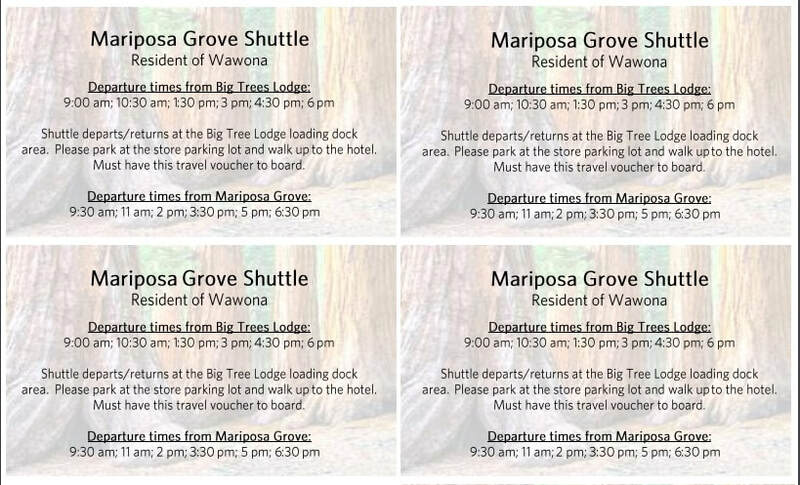 The free visitor shuttle to the Mariposa Grove of Giant Sequoias will also resume service for the busy summer season on the same day. When the shuttles are running, visitors should park at the South Entrance parking area and ride the free shuttle two miles to the Lower Grove. Visitors planning to hike in the Mariposa Grove of Giant Sequoias in April and early May should be prepared for winter hiking conditions. Up to two feet of snow remain in some sections of the trails in the Mariposa Grove of Giant Sequoias. Limited parking is available for cars at the Mariposa Grove Arrival Area when the shuttle is not in operation. At 7:30 am, the gate at the bottom of the Mariposa Grove Road will be closed to keep vehicles off the road as the shuttle operation begins. Cars displaying a disability placard can either drive to the Mariposa Grove Welcome Plaza, park in a designated space, then ride the shuttle, or they can drive up the Mariposa Grove Road and park at the arrival area or near the Grizzly Giant parking area. Parking is very limited and only available to cars displaying a disability placard. For detailed information about visiting the Mariposa Grove and current conditions in Yosemite National Park, go to plan your visit. Now is the time to think about defensible space and hazard fuel reduction. Residential burning is allowed on permissible burn days. Prior to burning, residents must verify burn day status through the Mariposa County Information Line at 209-966-1200. Notification of burning must then be made to the Yosemite Emergency Communications Center at 209-379-1999. While cooler temperatures have helped diminish the threat of wildfire, property owners and residents are asked to use caution while conducting burns, and maintain control of the fire at all times. Individuals can be held liable for allowing a fire to escape their control and/or burn onto other property. Safe residential pile burning is a crucial tool in reducing fire hazards. - Maximum pile size is 4 foot in diameter. - Clear all flammable material and vegetation within 10 feet of the outer edge of burn pile. - An adult must remain in attendance with a shovel until the fire is dead out. - Keep 5 gallons water supply or a charged hose at the burning site. - No burning shall be undertaken unless weather conditions (particularly wind) are such that burning can be considered safe. - No burning shall be undertaken when wind speeds or gusts in excess of 5 MPH are present or forecast. - Burn small branches and leaf vegetation debris only. If you have any questions regarding residential burning, please contact your local fire station. FISH CAMP — Travelers on a busy corridor leading to Yosemite National Park can expect delays this month due to necessary repair work on the roadway. Caltrans, in cooperation with Agee Construction, has announced one-way traffic control on Highway 41 near the community of Fish Camp in Mariposa County for four weeks as part of a culvert and roadway repair project. Beginning Tuesday, Apr. 2 through Friday, Apr. 26, one-way traffic control will be in effect on Highway 41 in Mariposa County north of Mill Canyon Road. This closure will be in effect Monday through Friday from 6 a.m. until 6 p.m. daily. Delays of up to 15 minutes at a time are possible while crews work in the area. Construction crews will be conducting one-way traffic control during this time with the use of flagging personnel through the work zone. Commuters are reminded to obey flagging personnel and pay close attention to road construction vehicles and personnel. ​This calendar is posted permanently under the "Calendar and Schedules" link on the menu above. April 12: Hooting Owl Fire Wawona Fire Station 6:30 p.m.
April 13 WAPPOA Wawona Community Center 9 a.m.
June 8: WAPPOA Wawona Community Center 9 a.m.
July 4: Square Dance Gray Barn 8—10 p.m.
July 20: Square Dance Gray Barn 8– 10 p.m.
August 3 Square Dance Gray Barn 8—10 p.m.
August 17: Square Dance Gray Barn 8—10 p.m.
August 31: Square Dance Gray Barn 8 –10 p.m.
YOSEMITE – Yosemite National Park is pleased to announce that Glacier Point Road and the surrounding trails will remain open for winter recreational use through Sunday, Apr. 14, conditions permitting. 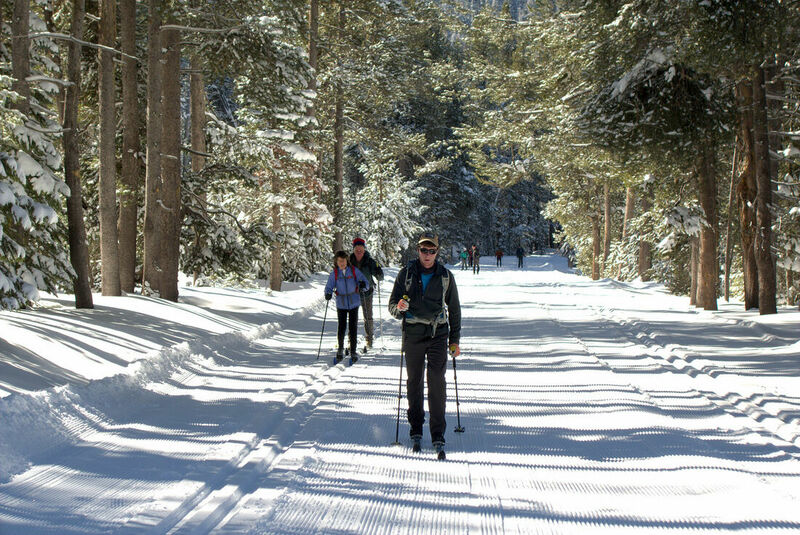 Due to the significant snow pack, the current trail conditions are great for cross-country skiing and snowshoeing throughout the area surrounding Glacier Point Road. Typically, winter recreational use in this area ends at the end of March when the park closes Glacier Point Road to begin seasonal plowing operations which begin on Apr. 1. All recreational users are encouraged to use the Old Glacier Point Road beginning from the Badger Pass parking area to access the Ostrander Lake Ski Hut and all other trails along Glacier Point Road. It is the visitor’s personal responsibility to be aware of their surroundings and stay away from all heavy equipment on the Glacier Point Road. Park visitors planning overnight trips in the area near Glacier Point Road must stop at the Badger Pass Ranger Station “A-Frame” and register for their overnight permits. Self-registration information is available at the Ranger Station when the building is closed. To learn more about how to plan for a wilderness trip in Yosemite National Park, please visit https://www.nps.gov/yose/planyourvisit/wildpermits.htm. The Yosemite Ski and Snowboard Area, including the Nordic Center and all other facilities, will close for the 2019 season on Sunday, Mar. 31. ​In 1935 Badger Pass was to be the "Switzerland of the West". Part of that dream was a hut and trail system, with huts at Ostrander Lake and beyond. Come join Howard Weamer as he explores what remains of that dream for winter backcountry access. A skier of many routes, Mr. Weamer is the author of The Perfect Art: The Ostrander Hut and Ski Touring in Yosemite. Mr. Weamer has also served as the caretaker of Ostrander Ski Hut for 45 years. So, if you've ever wondered why would anyone go back there, or if you want to be reminded, come hear what he has to say! Consideration and action on the approval of a packet of information to be used by groups or individuals who desire to use the school facilities. Consideration and action on the approval of a letter to CRMA cancelling insurance coverage as if 12/31/18, entitling YWECS to a partial refund of the premium for 2018-19. AB 1871 requires Charters to serve at least one healthy and nutritious school meal daily for any student who qualifies as “needy” (meaning that they meet federal eligibility criteria for a free or reduced-price meal) This meal must meet federal requirements for a “reimbursable” meal. Unless otherwise announced, the next regular meeting of the Board of Directors will be scheduled for Wednesday, April 10, 2019 at 5:30 p.m. at the Wawona School. We are pleased to announce the availability of a finding of no significant impact for the Wawona Wastewater Treatment System Rehabilitation Project. After consideration of the environmental assessment and public, tribal, and agency comments, the finding concludes that the project will not significantly affect the quality of the human environment. Preparation of an environmental impact statement is not required. This project will address deferred maintenance, improve visitor experience, and improve the operational efficiency of the Wawona Wastewater Treatment System. The finding of no significant impact is available in the "Document List" section at http://parkplanning.nps.gov/WWTP. The National Park Service plans to begin implementation of the project in fall of 2019. Thank you for your interest and comments throughout the project planning process. Public participation is a vital part of the environmental review process in Yosemite National Park. Your participation helps the National Park Service understand and consider your values and concerns. ​We'll be adjusting our clocks one hour forward. Daylights Saving Time officially starts on Sunday, March 10, at 2 a.m.. A common practice is to adjust your clock before going to bed. According to the History Channel's website, Germany was the first country to officially adopt Daylight Saving Time as a policy. They did so during World War I as an energy conservation tactic in 1916. Great Britain followed suit that summer. Contrary to popular belief, the practice was not popular among farmers, according to the History Channel. It was considered a sacrifice for war-time conservation, but not a practical measure for farmers, who had to wait an extra hour after the day began for sunlight to evaporate dew across crops and fields. Come join Wawona historians Ed Mee, Tom Phillips, and Tom Bopp for a unique presentation and discussion on Wawona history. Have you heard about Camp Hoyle or Vagim House? Do you know where the Wawona Arboretum was? Have you ever seen the proposed South Fork River Dam project? This month's Hooting Owl event will feature a panel discussion by three local historians as they address these pieces of Wawona history, and more. There will be time for Q & A with the panel, so bring your questions! You are sure to learn a few new things about this foundational corner of Yosemite National Park.